Full time blogging is a big step, particularly if you want to become a professional blogger. That means that your income is no longer just for a few more beers or taking your girl out for a great meal and then to the cinema or theater. It must pay the bills: your mortgage if you have one, the rent, power bills, your car and also feed you! It is a totally different situation to opening your laptop whenever you have the time and making a few posts each day. A full-time job is exactly that, and most people that work for themselves with their own businesses work longer hours than those that work for their boss. The difference is that the longer you work the more money you make for yourself – not for an employer! A professional blogger makes a living from the blog. Full time blogging is no longer just fun, but a job. You have to attract visitors every single day, and sell enough products each week to pay your food bills, the schools fees, the medical bills and pay for your vacation – and so on! If this seems a lot to you, keep in mind that many professional bloggers make enough for all of that and more. How do they do it? They probably won’t tell you, because such people realize that too much competition will affect their own income. That’s why you don’t read too much useful information online about how to become a professional blogger. Here are some tips. Millions of people are trying to make money with their blogs. You have a great deal of competition. It is important that you are noticed, and become noticed very quickly. Over 99% of bloggers starting up with new blogs fail to achieve that rapid recognition, so they fail in their attempts to become a professional blogger – at least first time round. If you have been blogging for some time and have a good following then you will have a better chance than they do. So tip #1 is don’t consider professional blogging until you are already making good money from your blogs. If you are making enough money each week with just a few hours work so that you can make a living by working more hours, then you can go for it! One of the secrets of making money with full time blogging is building up your own band of followers. Register with an autoresponder company such as AWeber, GetResponse or MailChimp and create a list for each of your blogs. Using their list-building software, generate subscription forms and publish a form on your main navigation sidebar. It will then appear on every post and page. Create a squeeze page designed only to collect contact details: offer a free gift such as an eBook or report in return for their email address. You can then begin to collect the contact details of your visitors so you can maintain contact with them. If you intend to become a professional blogger and make a living from it, you will have to set your blog up as a business. Part time blogging supplements your regular income. If your blog is your regular income, you must take a different approach. You have no paycheck each month to fall back on, so you must run your blog professionally and make money from it. You must first monetize your blog. There is a big gap between making a thousand dollars a month spending money and making enough to pay the mortgage, medical bills, food and everything else. You must draw up a business plan, brand the business and figure out how to make money day in, day out. People do this, so it can be done. 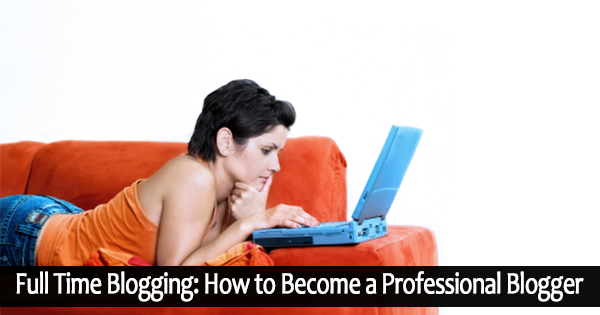 What steps do you need to take to become a professional blogger? Other than the business aspects such as maintaining accounts, saving for your pension and employing somebody to look after your taxes, here a few things you should be thinking about. Make sure you are involved in a niche that can make you money. Your hobby might be falconry, but are there enough falconers to visit your site and make you a living, year in year out? You no longer have the day job income each week or month to fall back on! Many make money promoting internet marketing programs and eBooks, although competition is becoming fierce. Make sure there is sufficient demand for what you can offer to make you a living. You can blog on multiple niches to make the best use of the demand that is out there for online information and products. Make sure your web hosting service enables you to run multiple add-on domains from your site. Then choose your blogging software. Use a service that enables as much customization as possible. WordPress is a good example of this, but use the downloadable service from wordpress.org that you can host from your own website. You can then adapt your blog to meet your needs. You can run multiple blogs from CPanel hosting service such as HostGator. Once you have chosen your main domain name, you can then add on an unlimited number of other domain names and run them as separate websites, each with its own WordPress blog. If you are already in a position to become a professional blogger, you will not need this advice of course. You should already be making money from your blog. However, it is provided for those with the longer term full time blogging ambition. Never give up the day job until you are making enough part time to warrant going full time! Construct a business plan: set annual income targets and break these down into smaller parts, such as monthly and even weekly objectives. Calculate your monthly outgoings and how much you must make to meet these. Plan how to make this income. Brand your business: get a good company name and logo. Invest in your business: get professional software where previously you used free versions and acquire some accountancy software to help you keep track of your profit and loss figures. Set up a taxation system, where you charge sales tax where appropriate and also pay it. Maintain an account of your expenses that can be reclaimed from your tax return. Knowledge of graphics applications such as Photoshop. 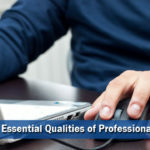 Knowledge of how to create professional videos. Good writing skills and grammar – not the approximate grammar of those who only believe they can write good English. Otherwise, employ ghostwriters. Extensive understanding of the various social media, and how to use them to your advantage. 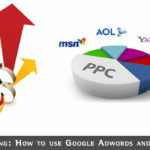 Good understanding of analytical software, and how to use Google Analytics and Webmaster Tools to their best advantage. A comprehensive understanding of Google algorithms, including updates such as Panda, Penguin and any other Google animals, preferably prior to their introduction. 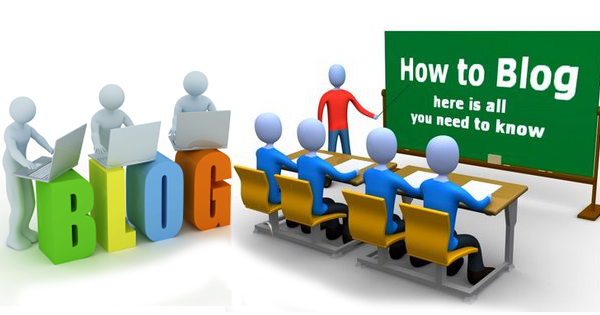 A comprehensive knowledge of how to promote your blogs and make the best use of visitors to them. Knowledge of list-building and the use of autoresponder software to maintain contact with those that visit your blog. Knowledge of where to access free gifts to offer your visitors. There are more, but these are the fundamentals of making money online from regular websites or from blogs. If you want to make a full-time income from blogging, you must monetize your blog. You can use AdSense, but this will only bring you a few dollars a day if you are lucky. Maybe enough for a Starbucks latte! Direct advertising sales on your blogs can provide you with a significant income if your blog has high search engine rankings. You may sell your own products or those of others. If you are reading this, you likely have a good number of products or services to sell, either as an affiliate or a reseller. Few people consider full time blogging unless they are already making a good amount of money. 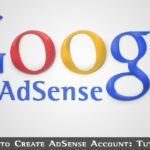 Google Adsense ads (keep to Google’s TOS) – small income, but regular and recurring. 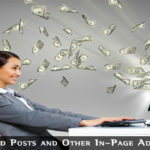 Selling advertising space on your blog. Write good content and get loads of visitors and people/businesses will pay you for advertising space on your blog. Selling your own services; set up blogs for clients, design WordPress headers, WordPress plugins etc. Affiliate marketing – done professionally, this can make you a great deal of money – but you also have a lot of competition. Paid reviews: You can get paid to review products on your blog. Checkout PayPerPost and SponsoredReviews. Membership Sites: If you have a specific skill, you can set up a premium blog program open to paid members. Run the free site, but offer the paid option for those wanting deeper analysis or special benefits. No doubt you can think of others, but these are the most popular ways that professional bloggers use to make money. Get your name known better by guest blogging on other blogs. Try to persuade some well-known names to guest on your own blog. Get your name and your blog’s name known online. Make sure you have a memorable brand name. ‘MyBlog’ might not work so much, but ‘Fire-SEO’ or ‘Killer-Quilts’ might catch the eye a bit better. Your objective is to catch the eye with your brand name and try to capture the contact details of every visitor. Become involved with other professional blogs and learn from them. If there is a network of bloggers in your niche, then join it. If not, then try to start one. Make sure that your posts are of high quality. That means that they offer good and accurate information to readers. Try to leave them hanging at the end, and then offer your newsletter for more information. Respondents can be added to the list you are building with the form on your sidebar. Don’t forget Google. This is the largest search engine by far, so keep an eye on your SEO. It is important for you to get a high ranking on search engines, particularly Google with around 80% of search engine traffic. Use article marketing and social networking to promote your blogs. Set up a Google+ page, and place G+ chicklets on your blog pages. To sum up, if you want to become a professional blogger, then you must first be blogging on a niche that has sufficient interest for you to make a living from. A good start point is if you are already making money, and believe that by working more hours you can make enough to give up your day job. Given that you feel confident that you can make enough with full time blogging, then you will give yourself the best chance of success by following the above advice. Free Premium WordPress Themes and Plugins: Why Are They Free? Indeed you shared nice and valuable information. Also, full-time blogging is one type of business. Although your tips are interesting and fantastic. Hope you update more and more topics. Nice Article. It’s really worthy to use it on daily basis. Every blogger needs content and this is the great tool they can use it to create their content at once. They have no need to think and write any article. You are amazing and you have given some best idea today. I’d love to take it.